Renovations are tricky for museums: You have to protect your permanent collection while keeping ticket sales up, which explains why so many museums close completely or move to new locations rather than repair an existing building. Not so at Munich's largest art museum, where workers simply built a gigantic scaffolding reconstruction next door. Pinakotek is actually a collection of four different museums, housed in an 11-year-old building in downtown Munich. Renovations were poised to force the sprawling institution to grind to a halt in February. But thanks to a proposal by German architect Jürgen Mayer H., the museum was able to continue operating almost normally—except for the fact that its galleries, meeting spaces, and offices had been moved a few yards away. 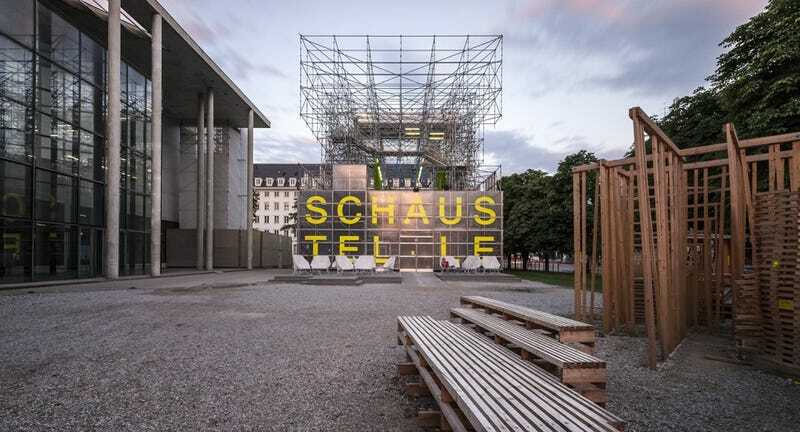 Mayer's structure is made from simple, off-the-shelf scaffolding parts. A network of empty cross-bracing, rising more than 50 feet into the air at times, supports container-style structures where the indoor spaces are located. Some of them are simple open-air platforms, where visitors can lounge on hammocks strapped to the steel rods. At night, a system of fluorescent lights illuminates the entire structure, making it look less like a building and more like a hand-drawn sketch of one. It's certainly not pretty by traditional standards—but it's dramatic.